A “fake” gun was brandished in the Matrix by a male student. 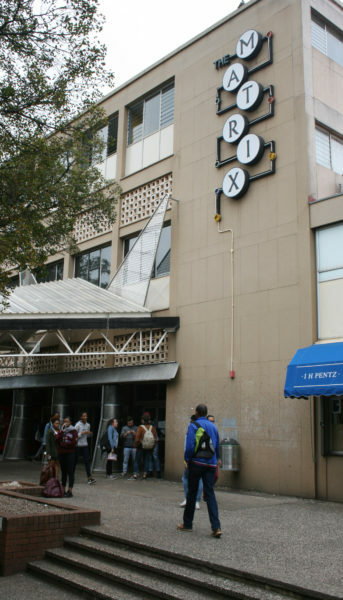 A male Wits student brandished a “fake” gun at the Matrix on Friday, April 13, sparking fear and anxiety in the Matrix which was full as it was a Friday afternoon. Witnesses told Wits Vuvuzela that when they looked for someone with authority to report the matter to, they couldn’t find anyone and there were no security guards either. “A student at the table next to ours pulled out a fake gun and waved it around,” according to first-year BA student Zakiyyah Mollagee, who said that the seriousness of gun violence should not be taken lightly. “Seeing someone wave a gun around with little regard for what feelings might arise in the people around him angered me. It made me feel unsafe and uncomfortable,” she said. The students present were not aware that the gun was “fake” until the student wielding the gun said so. However, they say he would not put the firearm away even after the other students had expressed feelings of discomfort, according to one of the witnesses. “It made me feel extremely anxious, I honestly thought someone was going to be shot by accident,” said Kelsey Wessels, a third-year BA student. She told Wits Vuvuzela that the experience shocked her and that the university should place more severity on the incident. “Wits should have stricter rules regarding gun violence and should take gun violence incidents very seriously, even though it was a fake gun,” Wessels said. The witnesses told Wits Vuvuzela that they were concerned at how easily the student had brought the firearm onto campus and the comfort with which he displayed it in a public space. “It was quite threatening because he waved it around as if it were a toy,” Wessels said. Wits Vuvuzela tried for two days to get comment from Mokgawa Kobe, the director of Protection Services, about this apparent security breach, and why there were no security guards at The Matrix when the incident took place. However, Kobe’s secretary kept saying he was not available and eventually a response was solicited from Wits Communications which stated that Protection Services were not aware of the incident and had not received any reports regarding it. Wits prohibits any dangerous weapons on its premises as the university is supposed to be a gun-free area. However, vehicles that enter the premises are not checked for firearms, nor are there metal detectors at any of the entrances to campus. In the statement to Wits Vuvuzela, Wits Communications said in terms of the Student Code of Conduct and the Rules for Discipline, “any conduct that creates the reasonable apprehension of harm or interferes with the University’s mission to create a conducive environment for learning, teaching and research could constitute misconduct. The penalty for misconduct is disciplinary action”. The student who brandished a gun has not been identified, and all that’s known so far is that he is a white male.